PETA euthanizes companion animals because there's a need for that service in their community. 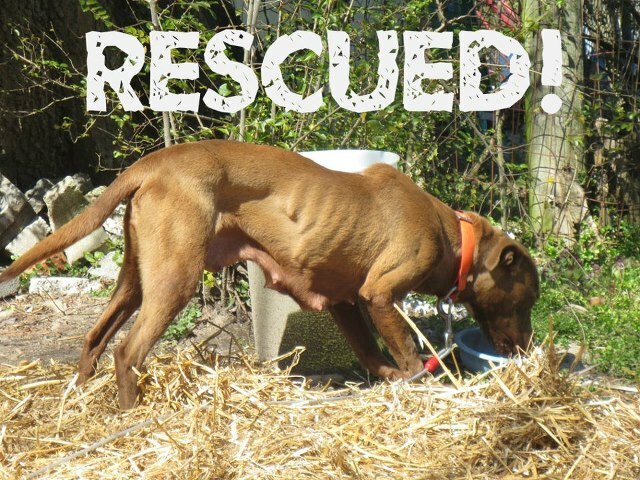 PETA is the only organization to offer the service of no-cost, humane, medical euthanasia to any animal in the greater Norfolk area who requires it. This service is available to animals 24 hours a day, 7 days a week, 365 days a year, days, nights, weekends, and holidays. PETA staff is always on-call to handle after-hours emergencies. Every animal should have the service of humane medical euthanasia made available to them when they require it. Because of PETA and their CAP (Community Animal Project) program, in Norfolk and surrounding communities, they do. PETA's CAP program isn't just about providing no-cost humane euthanasia to animals who require it. CAP program staff and volunteers provide other types of services to animals struggling in impoverished communities. They make food deliveries, transport animals to veterinarian offices for treatment and pay for their medical care, build and install all-weather animal housing, work with owners to get animals off of chains, and operate free and low-cost spay and neuter clinics throughout their service area. PETA began its CAP program sometime in 2000, serving both their community in Virginia, and several neighboring rural communities in North Carolina. PETA expanded its CAP community outreach program to include these North Carolina communities after learning from a caring North Carolina police officer that animals were living and dying in appalling conditions in four impoverished shelters and pounds there. After pouring over $300,000 into the project, building animal housing from the ground up and bringing existing animal housing structures up to code, one heinous reality remained unchanged for the North Carolina animals. 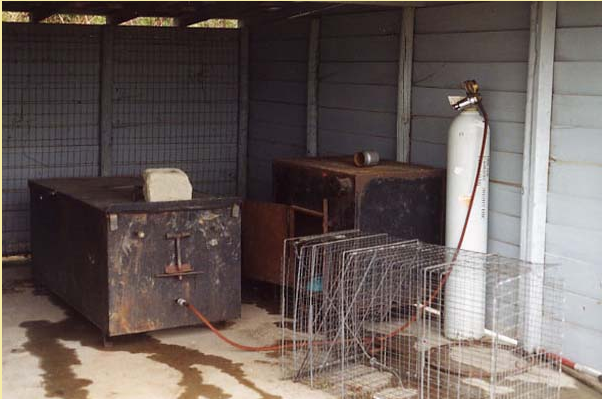 PETA contracted the services of a local licensed veterinarian to provide the service of humane euthanasia to the animals at one of the North Carolina pounds, replacing their previous methods of firearm, gas chamber, and heart-stick euthanasia. PETA's CAP staff and volunteers would provide the service of humane euthanasia to animals who were slated for firearm, gas chamber, and heart-stick euthanasia in the remaining three NC pounds. With the caveat that PETA would bear the financial responsibilities of performing the service of humane euthanasia and disposing of any animal remains, the North Carolina pounds allowed PETA to remove animals those facilities wouldn't be offering for adoption. The animal residents of these North Carolina pounds weren't just suffering horrendously barbaric methods of euthanasia and neglectful conditions, the majority of the animals were suffering from profound illness and injury as well. Many of the animals were succumbing to complications from conditions like advanced parasitic infestations, Lyme Disease, heart-worms, embedded collars, and compound bone fractures. While finding homes for these types of animals wasn't a realistic possibility, a slow, maddening death in a dilapidated gas chamber was. That PETA euthanized North Carolina animals, having what some people would consider to have been treatable conditions, has been the subject of a lot of controversy over the years. PETA was certainly between a rock and a very hard place. Virginia law requires that all animals entering the state be accompanied by a certificate of veterinary inspection verifying the health of each animal, and indeed, PETA did take many North Carolina pound animals to veterinarians in their area and covered the cost of their treatment. Adoptable animals die in Virginia pounds and humane societies every day for lack of available homes. Filling Virginia pounds and humane societies with animals from North Carolina wouldn't be fair to Virginia animals already dying for a home. The majority of the North Carolina animals PETA euthanized were unadoptable. The best that PETA could do for most of the sick and injured animals in the four North Carolina pounds was to provide them with a humane alternative to firearm, gas chamber, or heart-stick euthanasia, and that's exactly what they did. But PETA didn't euthanize every animal they took out of the NC pounds. PETA found homes for as many adoptable animals as they could. In fact, one of the North Carolina pound animals went to live at PETA's headquarters in Norfolk, Virginia. PETA's CAP program continues to provide food, shelter, medical care, and spaying and neutering services to animals in rural areas of North Carolina today. The NC pounds that PETA worked with in the past now contract with veterinarians who perform euthanasia using humane lethal injection, and they continue to make progress towards better welfare standards and more effective animal adoption programs. 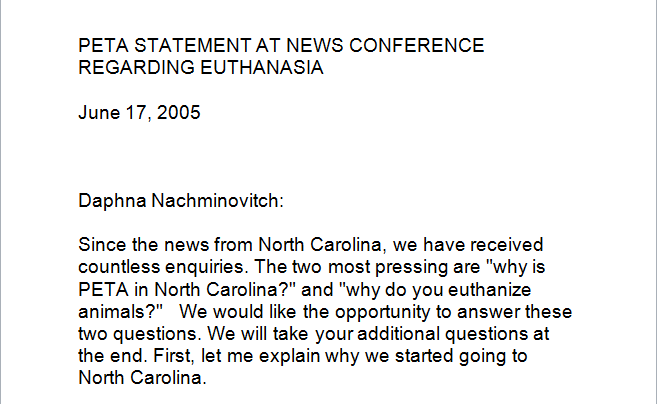 Comparing PETA's euthanasia services in North Carolina to their euthanasia services in Virginia, is comparing apples to oranges. In North Carolina, PETA euthanized animals who were slated for barbaric and torturous deaths in animal pounds, In Virginia, PETA's euthanasia services are part of their community outreach program, and most of the animals they receive are owned animals within the community who require humane euthanasia for a current crisis of illness, injury, or emotional devastation. 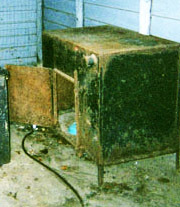 In 1990, while losing the decade-long battle to save two Silver Springs monkeys from even more experimentation and ultimately their euthanasia, PETA euthanized eighteen rabbits they removed from neglectful conditions, and fourteen roosters they removed from a facility that was breeding them for use in "religious rituals," after not being able to find homes for the animals. Interestingly, the Center for Consumer Freedom didn't touch this one, no doubt because the corporations they serve and protect don't have a problem with killing rabbits and roosters for the fur, meat, and egg industries, and they really don't want to draw attention to that fact. PETA did find homes for a portion of the rabbits and roosters they rescued, but when the imaginary well of available appropriate homes dried up, the animal rights organization was faced with either euthanizing the remaining animals, or warehousing them in cages until old age set in. Finding homes for rabbits and roosters has its own set of unique challenges, their sheer abundance not least of which. 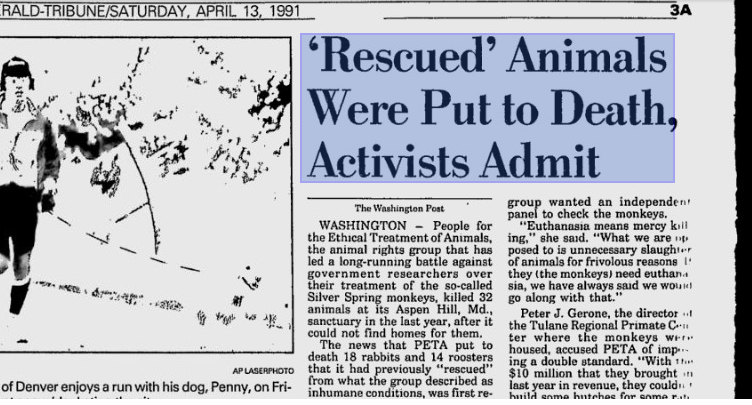 If you've heard of this story at all, you've heard about it from the perspective of animal researchers hoping to introduce you to the irony of PETA's euthanizing unwanted animals in their sanctuary while simultaneously filing court injunctions to save two biomedical research refugees from further experimentation and ultimately euthanasia. Or maybe you've heard about it from folks in the animal protection field who use it to bolster their case against PETA, or from "No-Kill" proponents who would like to convince you that anything is better than death, even if it's life in a cage, devoid of nearly everything that's natural and meaningful to the animal. Being an organization that doesn't turn its back on animals in need means having to make really hard decisions sometimes. There is absolutely zero indication that PETA is taking these decisions lightly, or is somehow not acting in these animals' best interests given the reality. Euthanasia has its place in animal rescue, and it's absolutely sometimes the kindest alternative. PETA isn't a traditional "shelter," and obviously, they make no claims that they're a traditional animal "shelter." They limit their intake to animals who require medical euthanasia because they are suffering, and to adoptable animals who have nowhere else to go. PETA either finds homes for the adoptable animals they receive, or transfers them to a high-traffic, high-adoption facility in their community. Read what else PETA has to say here. 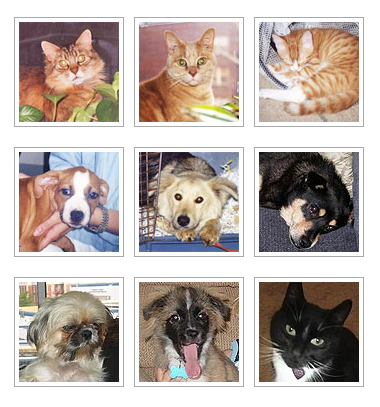 Nearly Every Animal PETA Euthanizes in Their Norfolk Facility is an Owner-Surrendered Animal. the Virginia Department of Agriculture and Community Services (VDACS) requires animal reporting agencies to log information regarding the "adoptability" of the animals they receive, but that's just not the case. There is no state-wide legal criteria for defining "adoptable," and neither the VDACS (Virginia Department of Agriculture and Consumer Services), or the State Veterinarian, Dr. Dan Kovich, DVM, MPH, asks reporting agencies to record and report such determinations. In Virginia, with regards to animals in animal releasing agencies, each of the three methods of "disposition" --transfer, adoption, and euthanasia--are each equal under the law. Because they are equal under the law, Virginia animal releasing agencies are not required to justify one method of disposition over another. Meaning, if Virginia's State Veterinarian doesn't collect data regarding the "adoptability" of the animals entering Virginia's animal releasing agencies, the Center for Consumer Freedom cannot make determinations of "adoptability" regarding the animals entering PETA's facility. A determination that the CCF can make from data collected from the VDACS and the State Veterinarian but chooses to omit from their propaganda, is that nearly every companion animal PETA euthanizes in their Virginia facility is an owner-surrendered animal. Virginia law requires all persons surrendering animals within the state to sign a legal release stating that they have been made aware that their animal may be immediately euthanized. 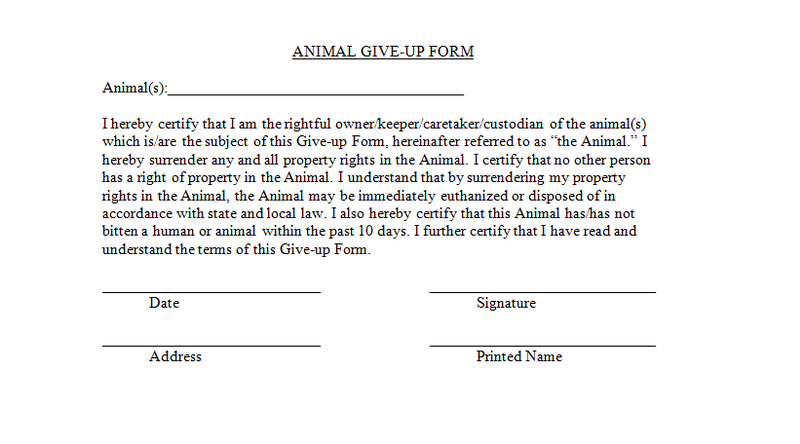 I contacted PETA regarding their owner-relinquish form, and they were kind enough to provide me with a copy. 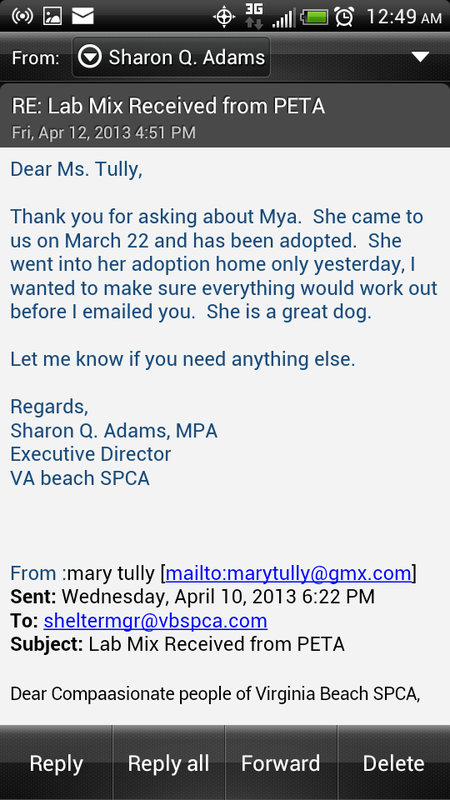 What is "Adoptable," and Who Makes the Determination? Being labeled "adoptable" is no guarantee that a safe, caring home awaits an animal. Shelters that want to limit euthanasia generally limit their admissions to animals they feel have the best chance for adoption, but all shelters make determinations about "adoptability." Shelters that have "open-admission" policies take all animals and make determinations about their adoptability after they've been admitted. Shelters with "limited-admission" policies make determinations about adoptability before admission, and less-adoptable animals are turned away to other fates. 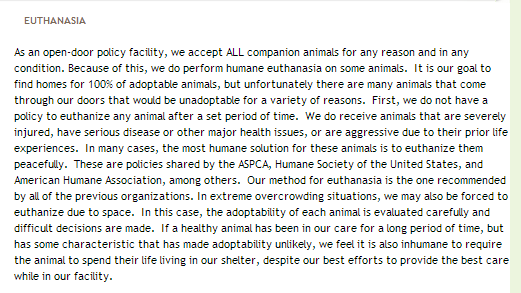 Below is the euthanasia policy of an open-admission "Documented No-Kill" shelter. I publish it here because I believe it best describes the sliding-scale nature of "adoptability," in the current crisis of companion animal overpopulation. When I contacted Virginia's State Veterinarian, Dr. Dan Kovich, DVM, MPH, February 7th, 2013, regarding PETA's animal releasing agency licensure, whether they're licensed as a "shelter" or a "humane society," and about the state's inspection protocol, he explained that there is no requirement of non-municipal animal releasing agency licensure in Virginia, so PETA is neither licensed as a shelter nor a humane society. I inquired about PETA's "organization type" listing of "humane society" on the VDACS (Virginia Department of Agriculture and Community Services) animal reporting summary form, and asked him to confirm whether the state considered PETA to be a "humane society" or a "shelter." Dr. Kovich responded "We consider them to be both." He went on to explain that the state considers "shelters" to be physical structures, so any releasing agency that has a building that houses animals prior to their disposition, is inspected as a "shelter," meaning, when the state inspects PeTA's "shelter," it's inspecting their animal housing. When I asked him to further explain the difference between "shelter" and "humane society," Dr. Kovich stated that the term "shelter" describes a physical structure, and the term "humane society" describes the organization's purpose. None of the organizations listed on the VDACS animal reporting record summaries are listed as "shelters" for that reason. An organization may be listed as a "rescue," "humane society," or a "city" or "county" agency, but organizations are not considered to be "shelters" by the state, even if the organization relates to the public that they are a "shelter" in their title. When I asked him if the term "shelter" is also used to describe organizations, he replied "Not as far as the state is concerned. Organizations can call themselves 'shelters,' but the state doesn't define organizations that way." Dr. Kovich went on to explain that while the public may consider the term "shelter" to be synonymous with "adoption facility," the state neither considers shelters to be adoption facilities, nor requires humane societies that have shelter structures to engage in adoptions at all, reminding me that the state considers each of the three methods of disposition--transfer, adoption, and euthanasia--to be equal under the law. I asked Dr. Kovich about about the 2010 Shelter Inspection Form published on the Center for Consumer Freedom's website. 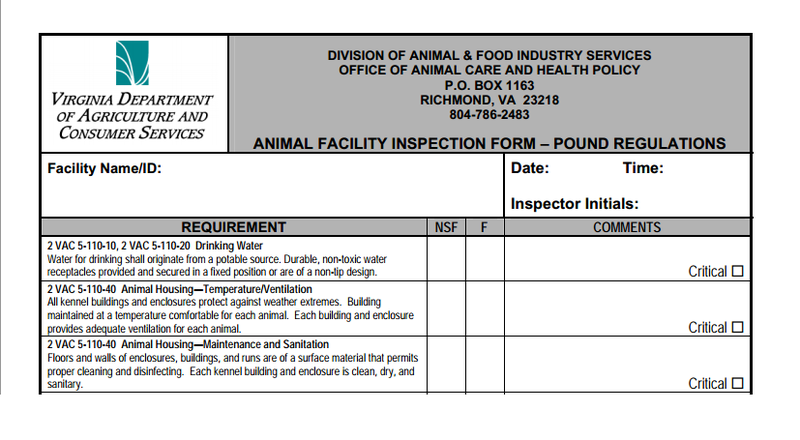 He confirmed that the report is indeed authentic and he stated that he felt that the inspection was warranted at the time to determine if PETA's animal housing should continue to be inspected by the state as a shelter. He stated that upon review, he felt that inspecting PETA's animal housing as a "shelter" was appropriate, whether their primary purpose as an organization was to find homes for adoptable animals or not. He reiterated that according to the state, each of the approved methods of disposition are equal under the law. The Center for Consumers Freedom's allegation that "The state inspector attempted to revoke PETA's license to operate a shelter," is unfounded. Dr. Kovich explained that the state of Virginia doesn't license non-municipal animal releasing agencies. There is no license to revoke. When I asked Dr. Kovich if he has reason to believe that PETA misrepresents their purpose to the public or to persons who bring their animals to them, he replied "To the best of my recollection, the State Veterinarian's office has never received a complaint from a citizen who felt that PETA had misrepresented their services in any way." When I asked Dr. Kovich if I could quote him on that, he replied "Sure." The state inspects PETA's shelter structure to make sure it meets the state's animal welfare standards. Most of the animals PETA takes control of are served in free or low-cost mobile spay and neuter clinics, and go on to live long, healthy lives with their families. PETA has spayed and neutered nearly 88,000 companion animals in these clinics so far. 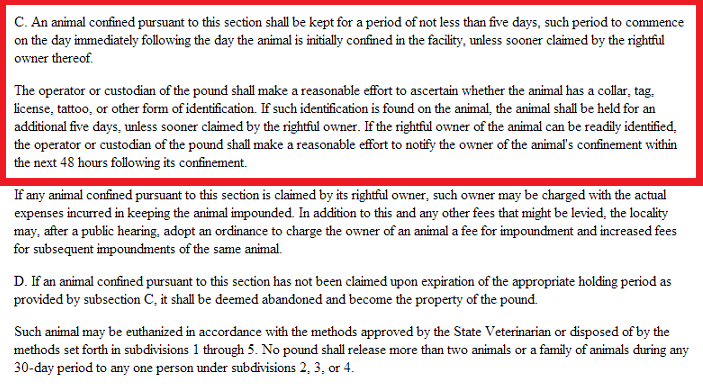 Virginia state law provides for the immediate euthanasia of owner-surrendered animals and suffering animals only. Any animal that PETA receives who is not surrendered by their lawful owner must be held for a period of no less than FIVE DAYS, and every reasonable effort must be made to locate its lawful owner. PETA refers adoptable animals that they cannot find immediate forever homes for to the Virginia Beach SPCA. PETA does occasionally receive adoptable companion animals in their Norfolk facility. I was able to confirm that animals that PETA cannot find immediate forever homes for are referred to, or transferred to, the Virginia Beach SPCA. An article was recently published in Huffington Post, suggesting that PETA is somehow doing the adoptable animals it refers to or transfers to the Virginia Beach SPCA a grave disservice. The author of the blog alleges that the Virginia SPCA is "high-kill" shelter, but this is simply not the case. The Virginia Beach SPCA's euthanasia rate is well-below the national, state and region average. You can view the Virginia Beach SPCA's VDACS reporting summary here. You can compare their numbers to the facility partnering with the Norfolk SPCA, Norfolk's no-kill organization here. The Norfolk SPCA states on its website that it is currently full, and is experiencing "at least" a ten-day wait for any future admissions. I contacted the Huffington Post and asked that I be allowed to counter these and other allegations published in the blog piece. Huffington Post has yet to respond to my request.